Michael Lawniczak of Swanton with the first of two touchdowns Friday in a 28-20 win at Delta. It was his first game back from injury. Delta’s Noah Druschel (4) and Seth Burres (5) combine for a tackle on Devon Crouse of Swanton during Friday’s game. Delta running back J.D. Osborn turns up field for a nice gain. He scored twice for the Panthers Friday night. 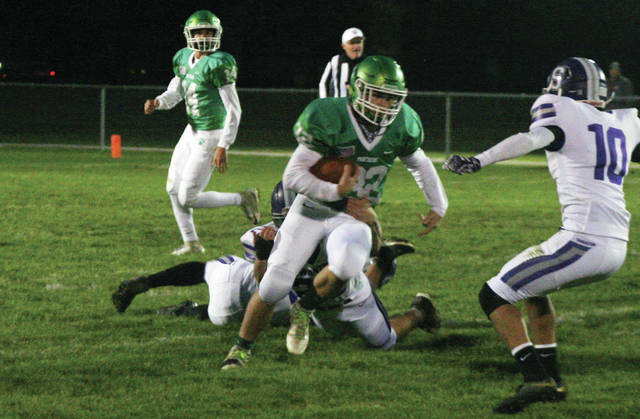 After Delta had rallied for 20 straight points, the Swanton offense regrouped for a pair of fourth quarter scores in a 28-20 win Friday night at Panther Stadium. The win kept the Iron Kettle in the possession of the Bulldogs. 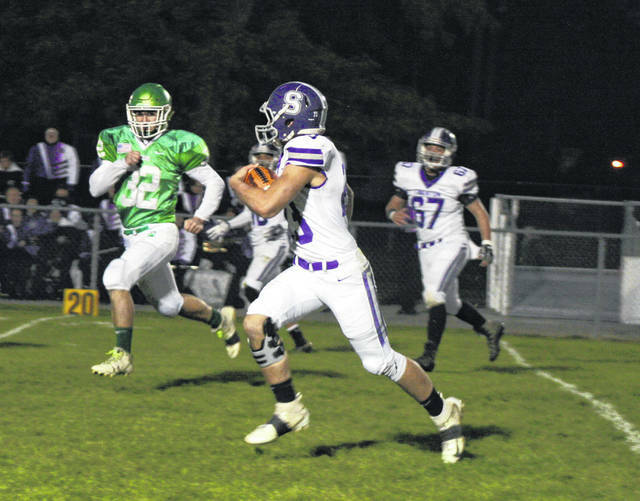 Dylan Gilsdorf put Swanton into Delta territory at the 46 yard line on a 16-yard gallop around the left end. They later got some big plays out of Hunter Mix. On a third-and-7 at the 33, he rushed for 13 yards. Mix followed that up with a catch out of the backfield where he advanced it down to the five. After getting dropped for a five yard loss on first and goal, Tyler Gowing exploded up the middle on second down for a touchdown and Riley Hensley’s extra point gave the Dogs a 21-20 lead with three minutes remaining. 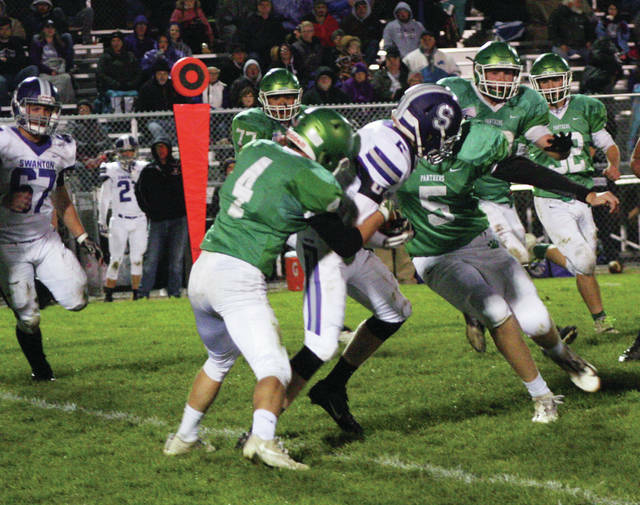 The Panthers went four-and-out on the ensuing possession and Swanton would turn it into points. Quarterback Andrew Thornton snuck it in from a yard away with 21 seconds left to put it away. Swanton jumped out to a two-score lead in the opening quarter. Their opening possession took just a minute and 38 seconds as tailback Michael Lawniczak – back from a leg injury – scored from 39 yards out for a 7-0 lead. Later in the quarter, the Dogs jumped on a fumbled handoff exchange at the Panther four yard line. They scored on the next play on a run from Lawniczak to put them up 14-0 at the 4:54 mark. But, the tide turned in the second quarter when Swanton roughed the punter to keep a drive going for the Panthers. They cashed in on a 36-yard connection from Dawson Swicegood to Noah Druschel and a Tyler McCullough extra point cut it to 14-7. That would be the margin at halftime. However, after the break, the Panthers took almost eight minutes off the clock and scored, cutting into the Bulldog lead even further. Delta converted four third and fourth down situations on the drive. It ended with a two-yard run from Osborn. With their kicker battling through an injury, the Panthers instead opted to go for two and the lead. However, Osborn was stopped and Swanton maintained a 14-13 lead with 4:06 left in the third. Delta took over the lead in the opening minutes of the fourth quarter. They got into scoring position thanks to Swicegood breaking through on a sneak on a fourth-and-1, running for 57 yards down to the Bulldog one. Osborn scored his second TD of the contest a play later, putting them in front 20-14 with just under nine minutes remaining. That lead was short-lived as the Dogs responded on their next possession. Swanton (3-6, 1-5 NWOAL) closes the season at home versus Archbold (6-3, 3-3) this Friday. Delta (2-7, 0-6) travels to Wauseon (3-6, 2-4).